A holistic, adaptive city of sustainable luxury. Manila Solar City is many cities in one, the intersection of multiple paradigms. Manila Solar City will be a new financial district with premium office space supported by top-of-the-line infrastructure and support facilities. The city is resilient, built to withstand tests from the elements without fail, ensuring that businesses and lifestyles are never compromised. Tiered development with cables and wiring safely nestled in a viaduct allows for operations to continue in the event of flooding. Buildings are built on piles and will be held to a strict code to minimize damage from seismic events. Manila Solar City is a generative city. Aside from being an economic engine, Solar City will also strive to produce as much power through renewable energies, neatly woven into the fabric of the city where possible. The main viaduct will be covered by photovoltaic cells generating 4 megawatts of power. This area extends CCP and serves as a transfer hub to Solar City. 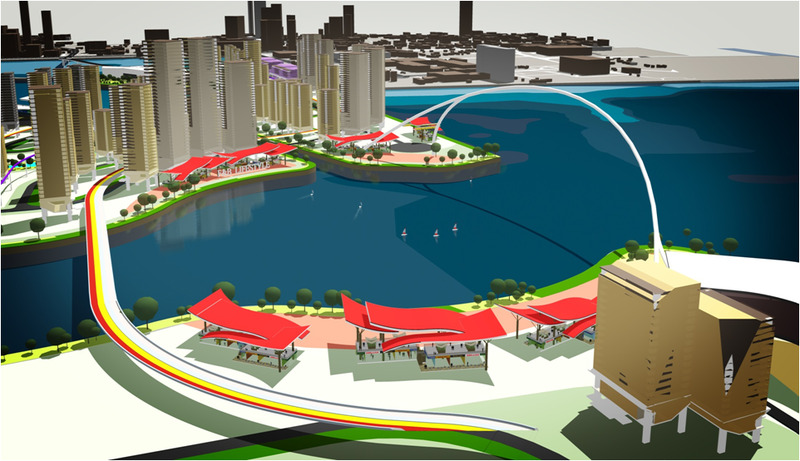 This area is home to the new Manila City Hall and Manila Yacht Club. An International Cruise Terminal will be sited on the south side and a seven-star hotel complex with a man-made beach will be on the northwest side.